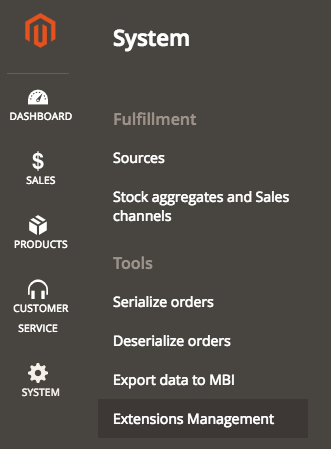 This section explains the Extensions Management function, which allows you to execute customized actions and processes in your Order Management System (OMS). Find the Extensions Management functionality in the System section of your OMS. This functionality allows you to execute customized actions in your OMS, in the Extensions Management Dashboard. Find the Available Extensions and Execution Log of the Extension Definitions that your System Integrator (SI) configured previously in this dashboard. These definitions are previously configured by your SI, and can be enabled in your Configuration Portal, which is not accessible externally yet. Please contact Magento to change this configuration. In this tab you can see a list of all available extensions for your OMS. Click View more to access the details of the extension. Then, you can see the instructions to run the extension and, if applicable, the list of parameters you need to add in order to identify and execute the extension. Be aware that fields with are mandatory and you must fill them in. Once all fields are completed, click Execute Extension to launch it. Extension Name Name of the Extension Definition. Executed by User who launched the Extension. Execution ID Unique ID for that execution. Execution Start Date Date when the execution was launched. Elapsed Time Time elapsed since the execution started. Status Status in which you can find each extension launched. Execution Log History of that execution. Click View Details to seee a detailed log of that execution. You can filter the results of this dashboard by using the Show filters on top of this view. Enabled Enables the functionality in your OMS. List of Extensions Shows the list of the available extensions. Click when you finished configuring your Extensions Management rule. A confirmation message appears. Unset Resets the configuration rule to the default value. This configuration is available through the configuration portal, which is not accessible externally yet. Please contact Magento to change this configuration. 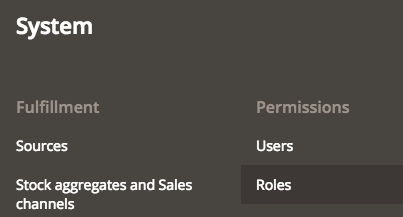 Here you can set the different functionalities a role has access to. For this case, make sure that the checkbox Extensions in Internal Tools is selected. As mentioned earlier, besides the possibility to enable the functionality in your OMS, you can see a list of the available extensions that the System Integrator can create for this functionality. You have an extension value by default, which can be filled in and it is ready to use. In case you would like to add other extensions values, first deselect the default checkbox, and click add a new value. Whenever you would like to remove a value, click . Name Name of the Extension Definition. Title Title of the Extension Definition. Integration Name Name of the Integration to be registered in the system. Description A description of the Extension Definition. Instructions Instructions of the Extension Definition. List of Parameters An unlimited number of required input information. The fields for these values should be strings, and they have a limitation in the characters allowed in their descriptions. For example, the value Description has a limitation of 350 characters. This value has the same characteristics as the root Extensions Management definition, where you can add more items, or remove them if necessary. You can enable/disable them when a parameter is required. When you finish setting up the different Extensions Management Definitions, click save rule.